Good morning world! I am woke up this morning to a four inch blanket of snow that continues to get thicker and thicker by the minute. Tennessee (and most of the country) has been plagued with terrible weather this past week and a half, but yesterday with our 40 degree weather, it seemed our wintry adventure/nightmare was coming to an end....I guess we were wrong! Of course the snow is incredibly beautiful and I am grateful for the dusting as it has given me the chance to write this blog post, cook breakfast, and watch an episode of Doctor Who before I have to head to my internship. When starting this blog a month ago, I had hoped to post every two or three days. With my last post being February 6th, I think I have gone a little off the mark. But today I am getting back to it! After reading this post on how to write a blog post in 30 minutes, I am inspired to be more attentive to my blog's schedule - even when school, work, & my internship seem tough. Since I am in my last semester at school as a graphic design student, I get to be a part of the student design showcase. This event is held annually to display the design work & portfolios of the students at Pellissippi for their parents, peers, and professionals trying to scout out some possible future employees. A group of local designers and teachers review each student portfolio individually as well. That being said, this is a pretty nerve-wracking event! Each student must complete a poster, mailer, save the date, & newspaper ad for the showcase as well as complete various other self-promotion projects before the event. These past three weeks, I have been working tirelessly on the poster & its counterparts because the student whose design is voted the best, gets to choose where his or her table is set up in the building for the showcase. Yesterday I submitted my designs and now I just have to sit and wait for the judging process to be complete! 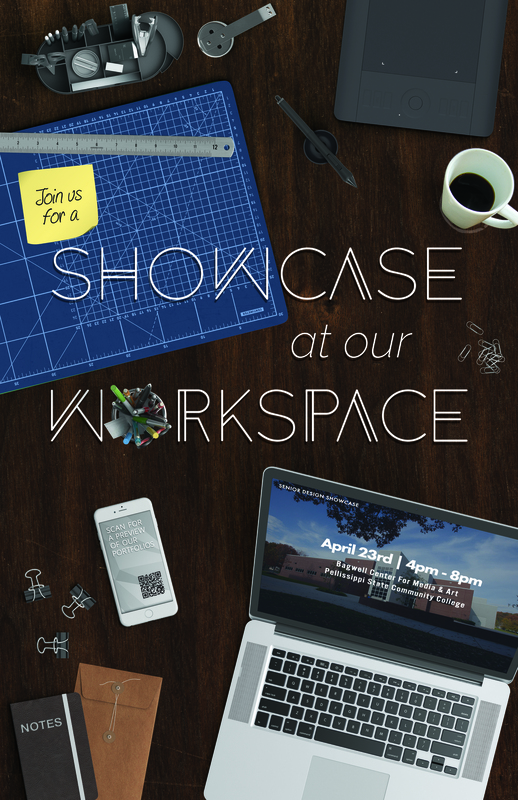 My theme for showcase is "Showcase at our Workspace". This is a preliminary version of my poster! Let me know what you think!